I had the opportunity to enjoy the great weather this weekend and learn all about “Liberty”, an American Bald Eagle by visiting with her at the Jamestown Audubon Society. Via special arrangements with the Center and volunteer Linda O’Brien, ten of us set out on a “behind the scenes” Liberty experience tour. Liberty has been living at the Center for about 8 years. A dedicated group of volunteer “Eagle Keepers” prepare and measure her food, track her intake and generally make sure she is very well taken care of. Behind the scenes are freezers full of fish from the Randolph Fish Hatchery and another big freezer of “rodents”. She never eats live food. When Liberty looses feathers, they must be picked up by the volunteers and stored until they are sent to the National Eagle Repository in Denver. After spending about an hour with Liberty, a walk through the Audubon Center building was in order. I met Milton and Lincoln, turtles who actually come out and visit with you. But, don’t try to pet them – they bite! The Jamestown Audubon Center & Sanctuary on Riverside Road, off Route 62 three miles south of the city, is a great learning experience for the whole family. There are five miles of nature trails, gardens, and lookouts allowing you to see much of the woodlands and wetlands of the 600-acre sanctuary. Inside the multipurpose educational facility there is a bird museum, exhibits and a nature store. Educational programs for kids and adults are offered year ‘round. 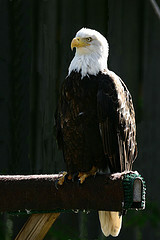 For more information on hours and programs, visit http://www.jamestownaudubon.org/ or call 716-569-2345. ‹ After Thanksgiving at Cross Roads!